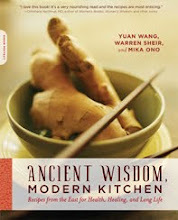 We're on a roll... We're thrilled Ancient Wisdom, Modern Kitchen has been named a finalist in the San Diego Book & Writing Awards! Thanks to the nonprofit San Diego Book Awards Association for the honor. Founded in 1994, the San Diego Book Awards Association honors the best published books and unpublished manuscripts by San Diego County residents each year. We'll be attending the awards ceremony recognizing finalists and category winners in June. For more information, see the San Diego Book Awards Associate website.